We need something new. That Bible on the shelf (or wherever it is, I can't find mine) is tired and old. Fortunately, we have apostles that are busy anointing other apostles, and they are proclaiming direct revelations from God! I can be blessed, especially if I make seed offerings to their ministries. Praise the Lord! It's all about me, God needs me to fulfill my dreams, the Holy Spirit can't function without me, God wants me to meet all my material needs and desires, and maybe I, too, will be told by an angel to preach "Kingdom Power". I'm so special, I don't know how he made it so long without me. Well, isn't that the kind of thing people are saying? Christians have turned into a bunch of biblically illiterate selfish owlhoots. We have enough problems of alleged "former Christians" who have rejected God and claimed he doesn't even exist (or God is evil) because he's not a magic wish-granting genie that jumps through hoops and is not at their beck and call. Then some professing Christians treat our sovereign Creator the same way! Say a formula and demand that God gives them what they want. God is holy and just, old son, not your errand boy, savvy? It's amazing that we have false teachers in pulpits, television, the Web, and so on that are being applauded for saying nonsense when people should be walking out on them. Can't be biblically judging a false teacher because "I don't want to miss out on a blessing". Such "theology" is feckless and fearful, and people like that need to repent. Many professing Christians are actually functional heretics as seen in a survey of Americans. I think it's well established that spiritual trends happening on this continent have already been established in Europe, and to a greater extent. People are not exercising healthy skepticism. The Bereans checked the teachings of Paul and Silas to see if they were supported by Scripture (Acts 17:11). Likewise, when I was a theologically liberal and ignorant teenager, a Fundamentalist would say something about the Bible, and I'd want to know if he could back up what he said. Today, we have people who are ignorant of the Bible that they claim to believe, and accepting false teachings because those folks stoke egos very well (2 Tim 4:3). Pay attention, also, to how those "teachers" claim to speak for God through the Holy Spirit, but glorify themselves instead of Jesus (John 16:14). God made it clear how to know that he sent a real prophet (Deut 13:1-4 and 18:20-22, Isaiah 8:20, Matt. 7:20) Many self-appointed "prophets" are frequently wrong and self-serving, in the style of Mormon false prophet Joseph Smith. Political "prophesies" are abundant. Opal Covey ran for mayor of Toledo, Ohio five times, and lost every time even though she was "told by God" that she would win. When she lost, she said she really won, but the election was stolen from her. (False prophet blaming others, and God cannot keep his promises, it seems.) William Tapley and Vonda Brewer are off the rails: Tapley says Donald Trump is the Bible's "777", and Brewer prophesied a terrorist attack on Election Day (she also said God told her Trump would be discarded by the Republicans). I saw people posting on Facebook that Donald Trump would win, and there was an utterance that God said the next president would "be a Senator". Not difficult to claim such things are prophesies, and when they go wrong, oh well, move on and do it again since professing Christians who follow them do not use discernment. One of the things I've emphasized in both creation science and theology is definitions. For example, the word evolution has several definitions. Some people will say that "change in allele frequencies" is evolution, therefore, muck-to-mocker evolution is true. Not hardly! The "change in allele frequencies" thing is accepted by creationists and has nothing to do with evolution. 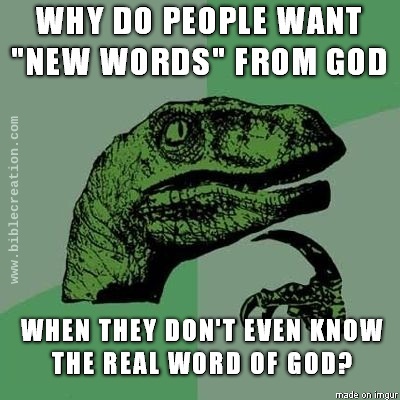 Similarly, people who promote the "sign gifts" (tongues, prophesy, and the like) deal from the bottom of the deck when giving proof texts and definitions of their views. Dr. Michael Brown dismissed the clear teachings regarding false prophets, saying those people are not false prophets, but instead, prophesied falsely. Besides, we're not ancient Israel, so those rules about false prophets always being right don't apply today (similar to arguments used to redefine marriage and sexual morality today). What is with this guy? He has the arrogance to change clear teachings of Scripture? A bit of that healthy skepticism should have people ask, "Where did God change the rules on prophesy, according to Scripture? Are Hebrews 13:8 and Isaiah 40:8 irrelevant now?" Once again, if people knew and believed the Bible, they'd leave these false teachers in droves. I think it's a sign of the end times that people are abandoning the faith and following liars (Matt. 24:10-11, 1 Tim. 4:1-2) instead of exposing them (Matt. 7:15-16, Rom. 16:17, Titus 1:9 and 1:13, Eph. 5:11-13, 2 Thess. 3:6, 2 Cor. 11:13-15). To hear more about Dr. Brown's compromises and affirmations of sidewinders, I refer you to this podcast and passel of supporting links from Pirate Christian Radio. Time is short, and we have work to do. We cannot be biblically illiterate, vague on the essentials of the faith, compromising, or condoning false teachers. Bible-believing Christians must saddle up and ride for the brand — the Word of God — and not go following other trails to those who do not believe the Word, and seek glory for themselves instead of Jesus.